The Nissan NV300 is a medium size van launched by Nissan in 2016. Its modern design is characterised by a high volume body. 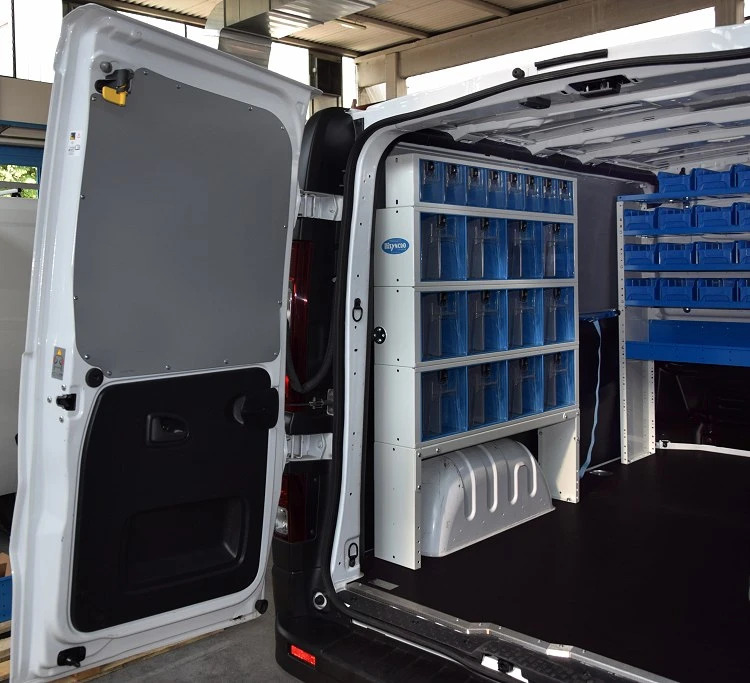 Especially in the low roof version, the load compartment is very square in shape, making it easy to carry a large amount of cargo and install racking. 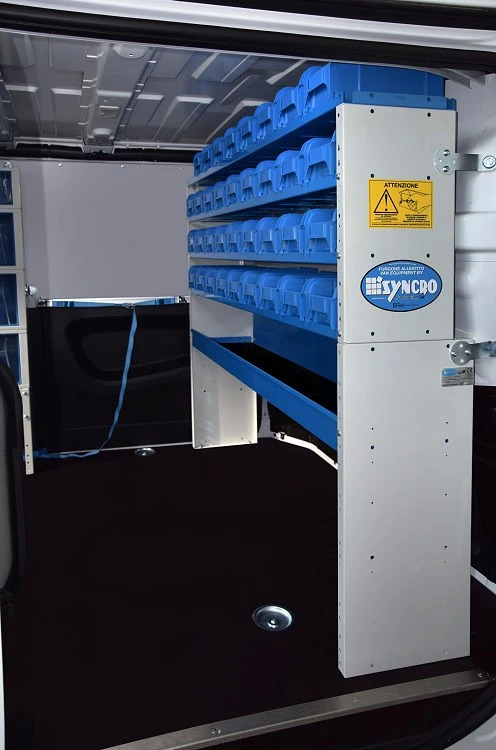 Thanks to the availability of modules of different depth in the Syncro System catalogue, the NV300 can be fitted with racking capable of carrying an impressive quantity of materials and equipment in perfect order and security while leaving most of the floor free for bulkier cargo. 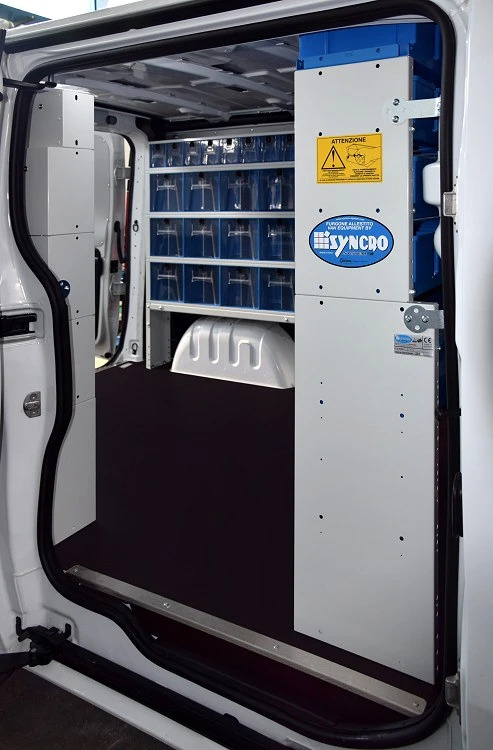 The first job Syncro’s installers did in this particular project was to fit a 12 mm thick resinated plywood floor liner with non-slip edging and cut-aways for cargo hooks. Floor liners are extremely effective in preventing damage to the metal floor of the van. They also provide a perfectly flat surface and secure anchorage for the racking. The next step was to fit protective liners on the walls and doors to safeguard the van’s bodywork and stop it suffering damage in daily operations. Syncro liners are laser cut to ensure a perfect match for the body panels and extremely effective at avoiding unnecessary body repairs in future. Moving on to the racking as such, the side walls are fitted with two columns of high strength steel cabinets with top quality transparent plastic containers. All these containers have built-in automatic locking buttons and the larger ones also have aluminium dividers. Syncro’s clear plastic drawers and containers are made from top quality PMMA, the same tough and long-lasting material used to make aeroplane windows. As you can clearly see, the reduced depth of this type of cabinet permits the creation of racking that protrudes no further than the wheel arches, leaving most of the floor free. Because the containers are transparent, it is easy to see exactly what is inside, something that saves a lot of time for the user. 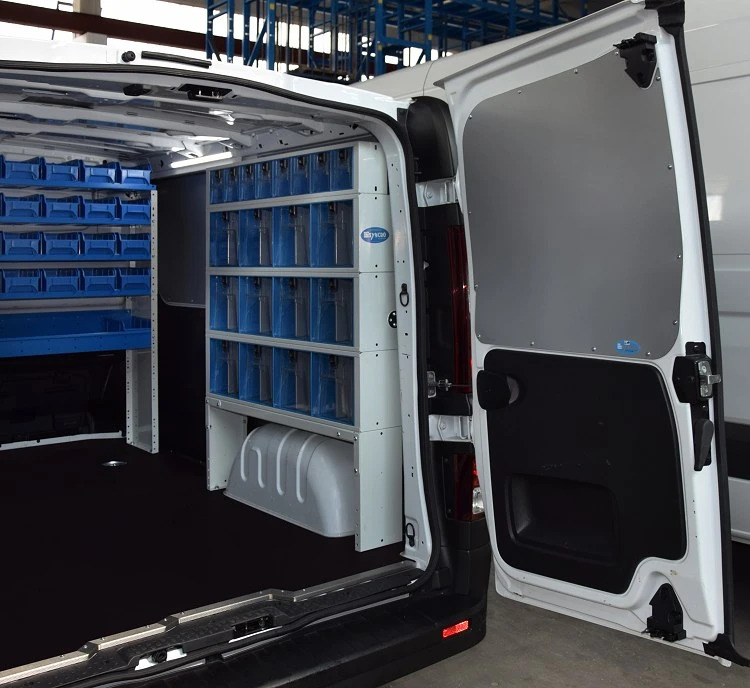 Racking has also been installed against the bulkhead of this NV300 and comprises, from the bottom up, an open cabinet, a shelf with a non-slip mat and metal dividers and four sets of 9 removable plastic containers. Even these containers can be fitted with aluminium dividers. 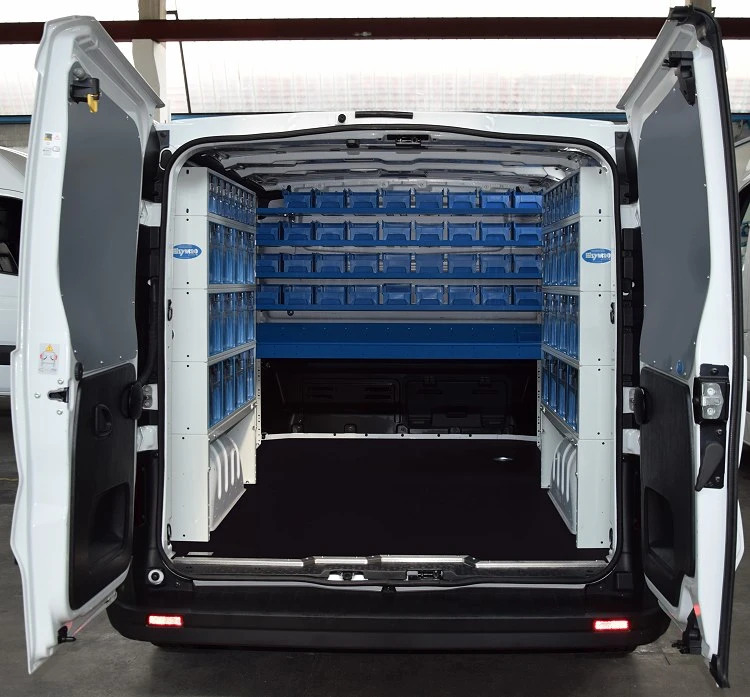 As a result, an impressive total of 136 different types of component can be transported separately in this NV300! The racking is complemented by an aluminium cargo bar with lashing strap and two powerful LED roof lights installed over the doors. Congratulations to the Syncro team! The user of this NV300 wanted 100% of the space between the wheel arches left free for cargo, and he must be 101% delighted!